I lived in Fairfield for awhile. My heart aches for you. I;m sure you have tried it all — but a couple suggestions. Can you spin his story to make it interesting enough forthe local news to pick it up as a human interest story? One of our horses go out and she was preparing to be a therapy horse and the local news ran a story. You have to make the story really interesting though — a little corgi “spin” might be needed 🙂 Also – have you talked with teh Westport Hunt Club? Horse people are corgi people and they have a huge membership an lots of teenagers who may be willing to hit the road looking for him. Just a couple thoughts. Know that Andy is an the prayers and hearts of many across the country and world! my ❤ aches for u. i have a 13yr old female boxer & a 5yr old female pit. i dont have kids but lets just say i dont need to becuz these girls r my babies. if anything were 2 happen 2 them i duno what id do. I live in the new haven/east haven/branford area & will facebook my friends who live in the area w/the info & we will keep our eyes peeled… im sure u have already done this, but keep calling & Faxing Andys poster/pix 2 all of the shelters & animal hosp. across the state & check the new haven register & other local papers such as East Haven Courier etc & the websites thepatch.com & doingitlocal.com. Keep up the efforts!!! Myself & whoever i can contact will try our best in our area!! We vow 2 keep our eyes peeled, ears open & keep up the effort in our area. as a sidenote, have you spoken with fidelco? i know they are not necessarily search & rescue dogs but they are service dogs… maybe after Karins team goes home, they can help… BRING ANDY HOME!!!!! I am so saddened to hear your story about Andy. I live in Ridgefield, not terribly far from Westport. Do you have search parties going? Can I help? I would love to help look for him. 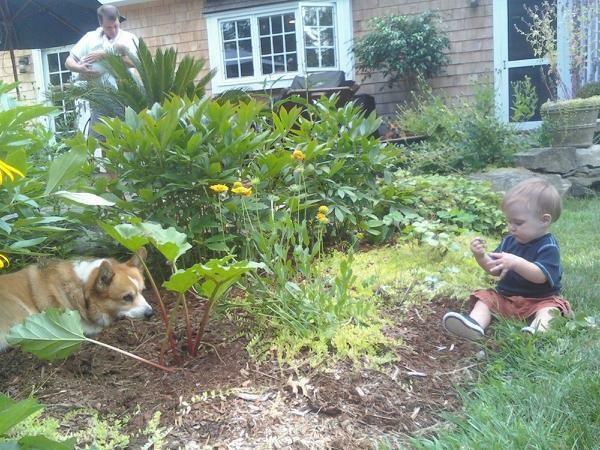 I have had corgis my whole life and would be devastated if my Lily got away. Please email me if I can help. Good luck, I’m keeping my fingers crossed for Andy! I sent this to my daughter at Fairfield University which is right by your last sighting. The kids are back today from winter break. Hopefully, one of them will find him. know the police have a reverse 911 but probably would not use it for this situation. And yes, you should definitely reach out to every news organization in CT, Mass and NY just in case the person that picked him up was driving through our area – if he was picked up. Good Luck – I will keep my eyes open for him. I would contact Scot Haney of WFSB. He is an animal advocate and no doubt would shine a spotlight on Andy for the public. Wish I could help but I’m in Litchfield County. Good luck, and feel encouraged that the tracking dog found his scent, and that he appears to have been picked up by an animal lover. I’m sure they’re looking for his owner. just a thought: maybe contact all vets in the tri statre area…if Andy’s been ‘picked up,’ he’s gotta go to a vet sometime?right? well, maybe. just an idea. You are really doing everything humanly possible!!!! what about grocery stores…someone buying dog food? Hi, I’m following your story all the way out here in Seattle. I wish there was something I can do to help you bring your Andy back home. The one thing I can do is pray and pray I will. I hope for now he is warm and safe and will soon be back where he belongs. I have never seen a dog more loved than Andy. I’ll second the Scot Haney idea! He’s always wonderful for local PR! to help Andy get home to his family by keeping our eyes open! you will have said your little prayer for him! Go home little Andy, go home!! A little Corgi dog named Andy has lost his way. His family loves him and misses him very much. I cant have kids..thus my beloved. Now boxer boys my sons. LABBIE BOYS over rainbow bridge. 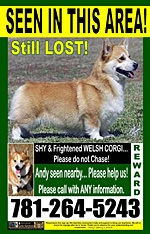 Please lk into http://www.LostNySoggie.com..automated lost pet alert to 1000+ homes…if you choose..a great addition to wealth od tools already implemented. God, if andy was pucked up, please please ket this person…people. see all media abd know where Abdt neds to be!fax all vets..area and beyond..or email theamazing videos to businessess too bear sighting..shelters vets mant police dept ri pur in theur log email grocery stores gas stations.. you necmver now..si no place off limits. love and lucks and genuine geartfelt caring and prayets to tmyou andt and akl..from all of us!!!! narrowed down His vicinity? THANK YOU!! Liza Clancy What about bating the traps not just with food, but with his Mom’s clothing. She could wear t-shirts everyday and leave one with each trap or along a path you think he will take. He could smell her scent and feel safe, or he even might wait in that spot until she comes back. We’ve seen the posters surrounding every part of our daily lives. I’ve wondered how the search go. This is probably the craziest long shot, but have you thought of talking to a seer/medium? On several horrible points of my life, I was reduced to such means, just to keep my anxiety from getting the best of me. There’s a lady by the name of Penelope. I know this doesn’t carry much clout, but she was listed in New York Mag as one of the best readers. She’s located a large sum of Missinf monies for me. I know that’s not a pet, but she’s very very good and would probably work free if she one’s your situation. Her name is Penelope and her e-mail is penny1d@aol.com. Put in the subject line: The Guy Who Gave You The Finger: Daughter-In-Law says you can help me. She’ll know who I am and that you’re in legitimate need. I will keep looking at your post for updates and check in with Penelope today to alert her of your situation. Best to you and Andy, he’s out there and he’ll get home to you!!! Sorry for the horrific grammar. I’m on an iPhone and under the weather. Can’t see the little keys too well. You need to call up this animal psychic…there is a fee but she is the real thing and known to bring back lost pets. Call her up as soon as possible. I pray you find Andy. have you tried fidofinder on the internet? I travel around a lot in lower Fairfield County, and I am always on the lookout for Andy. I hope so much for you that he is found soon. I would also recommend contacting Scot Haney of WFSB, and he also has the morning show Better Connecticut. Also, try contacting WPKN radio. They have thousands of listeners in your target area and beyond. And other radio stations, ask if they could run a spot during commuter hours, when people are out on the road. I re-posted this on my blog, hopefully someone can find him! Have you tried an animal communicator? We had a similar story to yours last year and used Hillary Renaissance in Seattle (she has a website). She’s very skilled at locating lost animals and is a lovely person. Have you gone on to Craigslist in and around your area. They have a lost/found section. There are many pets listed in my area (Philadelphia) that have been found in recent weeks. Just a suggestion. We are praying for his safe return! ROUTE 123 in Norwalk, near the cemetary, I witnessed Andy, as he watched two Pit Bulls who seemed friendly running and playing, Andy however, was watching from the sidelines, he looked healthy and fed, and not as if he was lost at all. It almost appeared he knew the other dogs, someone might had called the dog warden but not sure, they were more fearful for the pit bulls that were stopping traffic..Andy was not too visable, but right there! I wish I had seen this post sooner! My best, I’m printing the poster out, hopefully he makes an appearance again soon! If I see Andy again, I will be sure to snap a photo and record where he’s heading, but know he is in the Broad River area as of June 9th..Best of luck, I know this is terribly painful! Deborah….did you ever reach Jordina on the phone to relay this info..
Just wondering if Andy has been sighted or anything happening at all please let me or us know please!! Dear Heavenly Father, thank you ever so much for sending a signal to Andy’s family and all of us that he is alive and well and might be searching for home! Please, Please lead him to his awaiting family and new home before your beloved birthday as a gift to his family! They need him home soo much and it’s time to complete this family once again! Please Lord we love you and know you work miracles and we pray this will be one!! In your Holy name…Amen. Greetings from Dinteloord, Netherlands.Does your blog get many junk posts? and we are seeking to swap techniques with other people. If you’d be interested, please get in touch with me via email. We are desperately searching for a lost Sheltie. His page is Help Scotty Home. Any help you can give us would be greatly appreciated. He is a tri-color, 18″ tall at the shoulder and 47 pounds. He was hit on Friday evening and is limping behind. No sightings since Monday evening on Worthington Drive near rt.100 in Exton, Pa. Thank you. My number is: 610-220-2723. My name is Susan Butler.